Description First WAC officers at O'Reilly. 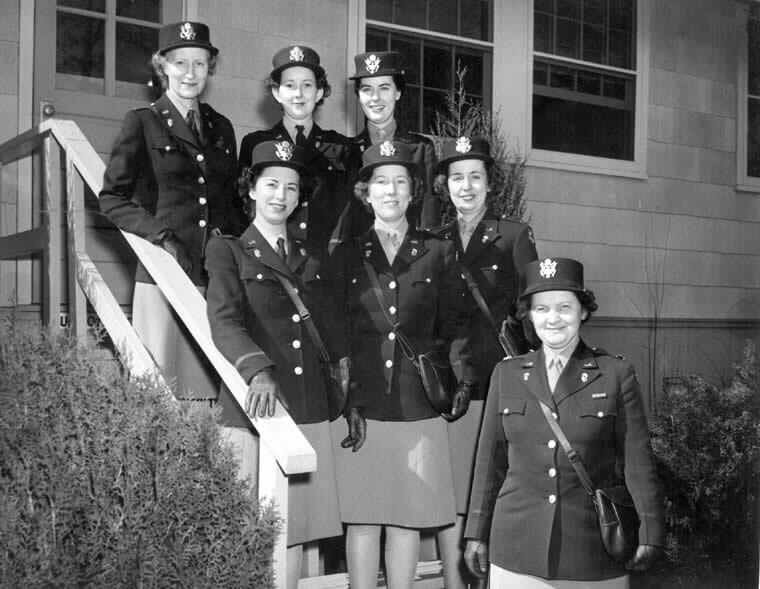 According to an article in the Springfield Leader & Press, 2-8-44, p12: Row 1: Major Mary Bell; Row 2: 2nd Lt. Harriet M. Fivenson, fiscal officer, 2nd Lt. Mary L. McPherson, assistant sales clerk, 1st Lt. Hildegard I. Reiche, assistant registrar; Row 3: 1st Lt. Prudence Merriman, chief civilian personnel branch and Army emergency relief, 1st Lt. Amber Moult, assistant finance officer, 2nd Lt. Mabel M. Stocks, assistant registrar. Subject Military hospitals -- Missouri -- Springfield. ;O'Reilly General Army Hospital (Springfield, Mo.). ;United States. Army. Women's Army Corps. ;World War, 1939-1945 -- Hospitals -- Missouri -- Springfield. ;World War, 1939-1945 -- Participation, Female. ;World W;World War, 1939-1945 -- Photography.